NEW VENUE! Arena MK, Milton Keynes. 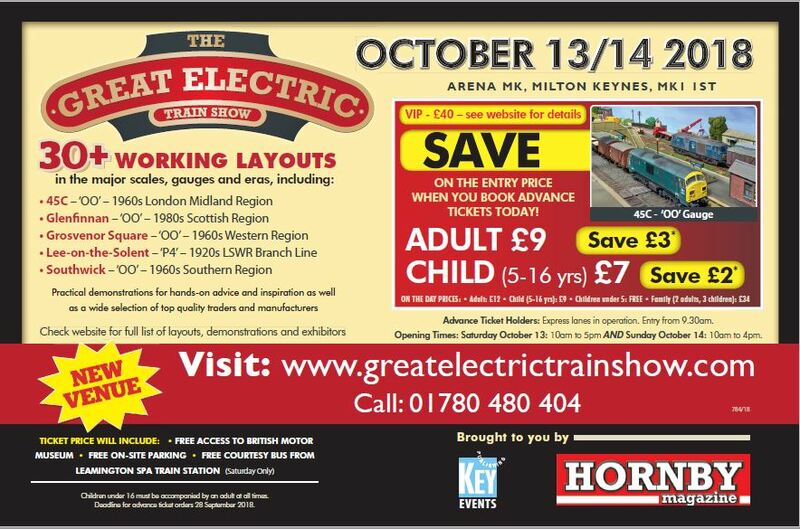 I went on Saturday and enjoyed the show, its the first one of that size i have been to, it was really really busy and got rather hot but some really nice layouts on display and worth the trip. Your best bet is ask others to find the quietest time, Warley is just the same. Also look at the layouts and traders and decide before you go which ones you want to see and plan accordingly! In all honesty the only trader i looked at in detail was TMC, thats partly because i know there stuff is worth looking at but also because they had an end stall so it was a little easier to get in - Rails etc who had stalls in the middle of a row i didn't even bother to try getting in to look at it was so packed! Sounds like me with my mobile phone. Although I couldn't get to the show, I went to a toy and train fair this weekend and it was HEAVING compared to most I've been too yet is was a regular venue run by the same people as usual. That TV programme must be infecting people. I went on Sunday and must admit I was impressed with venue and the layouts. It was well organised with plenty of free parking. A plus for me is that it's only 20/25mins drive from where I live and I've been to Ikea that many times the car knows it's own way there. I went to the previous 2 at the Motor Museum and this was a 100 times better. I had an advance ticket so turned up at dead on 9.30 to find no queue and just walked straight in. The weather was very wet which may have had an effect on that day's attendance. I found that the busy time was between 10 and 1.30 when it seemed to get quiet after that. It was however very comfortable all the time I was there up to 2.30. By comfortable I mean the crowds round layouts weren't 4 deep like you sometimes get. I must admit I'm a bit of a wanderer at exhibitions. If there's a lot of people round one layout I move on and go back later. I also visit most layouts 2 or 3 times. I don't usually bother with the traders unless there's something specific I'm after. The end of the year is a good time for exhibitions for me. Beginning with the GETS in October followed by Warley in November and Peterborough (20 minutes in the car) which is now early December. It's usually when I get my locos/rolling stock weathered. At the weekend I took 3 coaches to TMC and my Heljan 05 and a BR Type 2 to Grimey Times to be weathered. I'll pick them up at Warley next month. If the modelling budget allows I may take a couple of steam locos to Warley for TMC to weather then pick them up at Peterborough. It saves me a lot on postage and of course the chance of them getting lost in the post. Over the years I religiously went to Warley on the Saturday but a couple of years ago I went on the Sunday and the difference was amazing. Look at the bottom left hand corner of the poster for this year's exhibition in the first post. I think somebody forgot to check the information. They are still advertising free entrance to the Motor Museum and the shuttle bus from Leamington Spa Station. Oops. I went Saturday morning, they still need to improve on their hall layout, there should definitely be one cross aisle in rows of that length. The hall's lighting made Hall_5 at the NEC look good. Free parking was a bonus. A couple of layouts seemed to be running their timetable in real-time without making much effort to engage the audience. Nice to see more 0 gauge. Also pleasing to see or should that be hear that the sound equipped layouts had attempted to get the level right for what was happening, not just to show off that they had sound. Hatton's stand was definitely trying to get the message across that they are not just box pushers for the rest of the industry. Better than it was in the Motor Museum, but they still could improve it. Bufferstop wrote: there should definitely be one cross aisle in rows of that length. Bufferstop wrote: A couple of layouts seemed to be running their timetable in real-time without making much effort to engage the audience. I did notice that, at the same time there was one layout that had trains staggered so as soon as one made it off the layout the next was entering - it worked really well as there was always something going on. I bet organising that many trains that quickly was a job in itself! alex3410 wrote: there was one layout that had trains staggered so as soon as one made it off the layout the next was entering - it worked really well as there was always something going on. I bet organising that many trains that quickly was a job in itself! That's the way i try to run mine. You have to have stock with similar characteristics and (with DC) a nifty set of hands to change points in the fiddle yard but it works well, especially on single track ovals. alex3410 wrote: I went on Saturday and enjoyed the show, its the first one of that size i have been to, it was really really busy and got rather hot but some really nice layouts on display and worth the trip. Going on a Saturday often means there are shops open to keep the other half busy, whilst you are at the show. I'd got a ticket for the Sunday, but when I realised Mrs W would be at a meeting for most of Saturday I decided to go on Saturday, flogged the Sunday Ticket to Sishades. I suppose I'm fortunate my wife actually likes coming to events with me, she's not a bad judge of the layouts either.